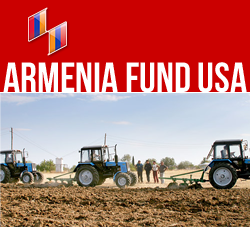 NEW YORK, New York — Within the framework of its ongoing Rural Development Program, Armenia Fund recently began construction of a vitally needed community center in Aknaghbyur, a village in Armenia’s Tavush Region. The project is sponsored by the Fund’s French affiliate, with the financial support of the France-based Tavitian family. Aknaghbyur is the site of several development initiatives that have already been implemented by Armenia Fund, including the community’s state-of-the-art natural-gas, potable-water, and irrigation networks, all of which have vastly improved the daily lives of the residents. To date, construction crews have laid the community center’s foundations, erected the pillars and built the supporting walls. Work will resume following a short pause due to the harsh winter weather. Ararat Khlghatyan, Hayastan All-Armenian Fund’s Deputy Director in charge of construction projects, said that the two-story building of the community center will house the mayor’s office, a clinic, a library, and a concert hall, thus becoming a vibrant hub for local governance, healthcare, culture, and the arts.